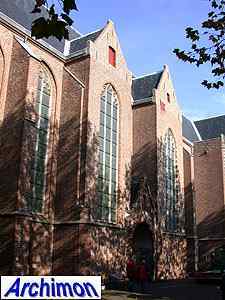 Lying a bit hidden behind a part of Utrecht's centre that is completely spoiled by modern buildings is this church. 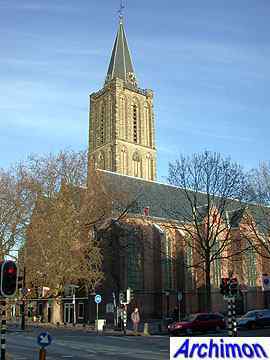 Once one of Utrecht's four parish churches, now a reformed church. 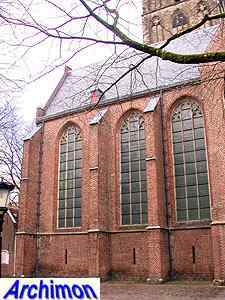 The Jacobikerk (St. James church) is a late-Gothic hall-church consisting of three aisles of equal height and width, each with a choir and vaulted in stone except for a small part. 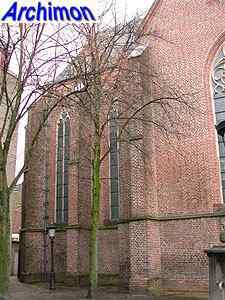 The tower is enclosed on all of its four sides. 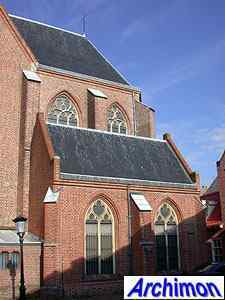 Although the church has a transept, it does not extend the overall width of the building. 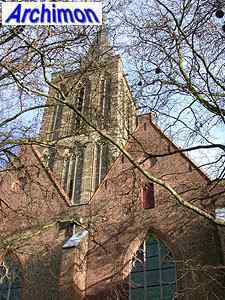 The history of the church goes back to the 12th century, when a predecessor was built, of which no traces are left. In ca. 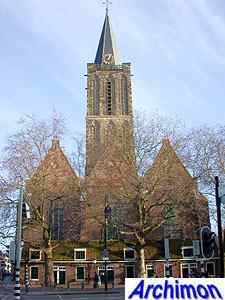 1290 an early-Gothic cruciform church was built, together with a low, still externally positioned tower. 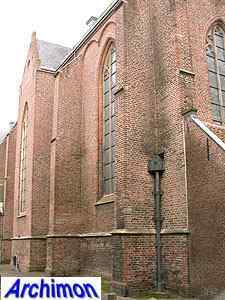 Of this church parts remain in the central aisle of the current building. 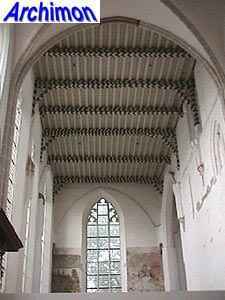 Probably in the second quarter of te 14th century a new transept was built against the east end of the old one, followed by three choirs; a big polygonal one, and two smaller square ones. Ca. 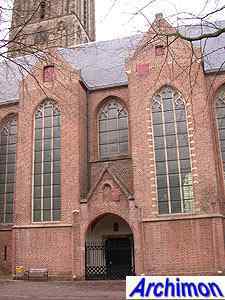 1340-1350 the tower was heightened, resulting in the current structure in Utrecht Gothic-style, characterized by the series of three narrow but tall niches in each tower segment. 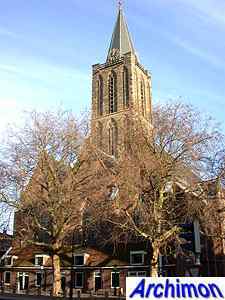 Between 1391 and 1404 the tower was enclosed by the addition of a new western part to the church. 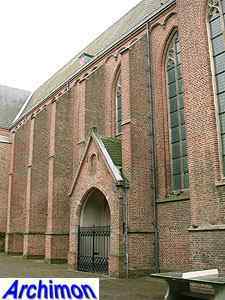 At that time this west facade consisted of a high middle part flanked by lower parts on both sides. 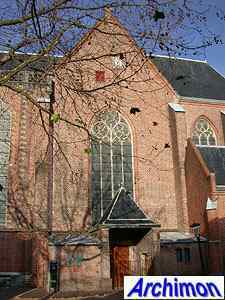 This part of the church is called the Achterkerk ("back church"). 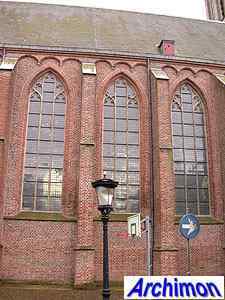 Master builder Willem van Boelre removed the old transept ca. 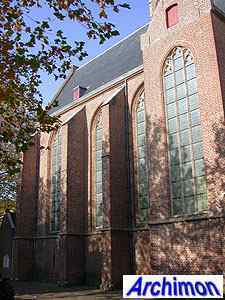 1423-1433. 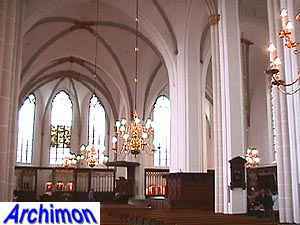 At the same time new side-aisles were built that were as wide and high as the central aisle. 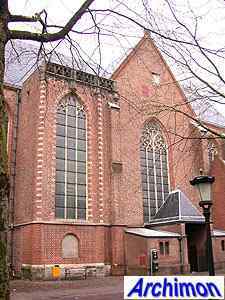 Due to this the remaing transept no longer extends. 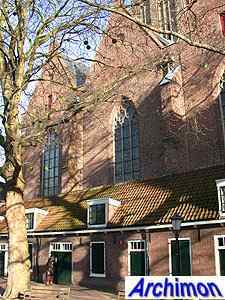 In 1461-1462 the Achterkerk is adapted to the new state of the church as well, resulting in the current state with three identical gables. 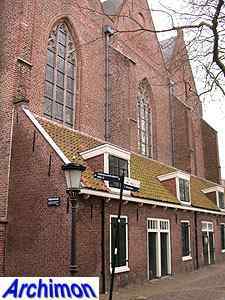 The row of small houses in front of it dates from the 18th century. 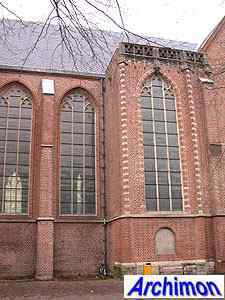 The small lateral choirs are replaced by larger ones at the end of the 15th century. In 1558 a storm destroyed the spire at the tower, dating from 1410. 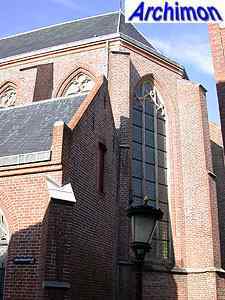 The new spire in its turn did not survive the storm of 1674, which caused great damage to most of Utrecht's other churches as well. 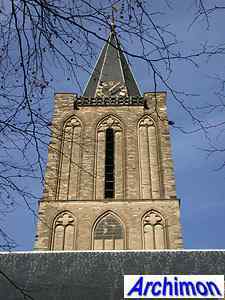 Since then simple roofs had been added, until during a major restoration from 1942 until 1954 the current octagonal spire was added, which is about ten metres shorter than the original one. 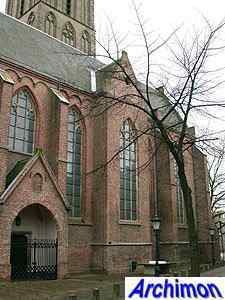 Early during the Reformation the priest of this church declared that the Jacobi from then on was a protestant church. It has always continued to be so since. 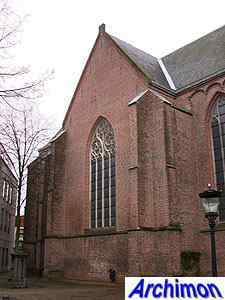 Part of the stone vaulting was destroyed by cannons during the siege of castle Vredenburg in 1576. 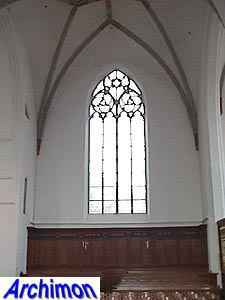 It was replaced with the current painted wooden ceiling. Fragments of murals have been made visible again during a restoration, after having been painted over for centuries. 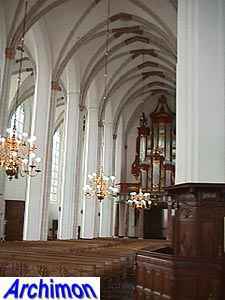 White-painted interiors with no traces of the former catholic decorations were virtually standard for protestant churches.